Glanycus insolitus Walker, 1855, a member of Leaf Moth Thyrididae, male and female are very difference in color. The male with shining dark blue wings but female wings are red with black and dark blue marking. 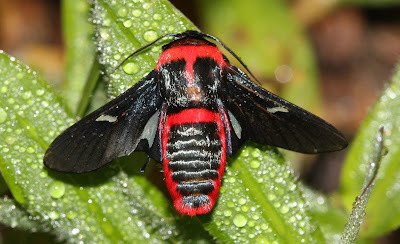 They are very small moth and close to members of Sphingidae, colorful insects but attracted by a light trap. They are wide distributed insects, the holotype was collected from Bangladesh.